The weather today in Tasmania was pretty ordinary, but I did need to get out. Too many sick people at home! I had been eyeing off the various tracks around Ridgeway, and given the weather, it seemed like a good day to do some exploring lower down. I parked at the entrance to the Ridgeway Reservoir. You can walk along the firetrail and then head downhill (on the No-Through track) to come out next to the eastern end of the dam wall. The dam really is pretty large. 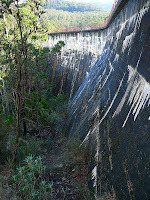 You can obviously climb down to the base of the dam, which I didn't do today. I understand you can get a good echo from the dam wall too. This might be a place to take the kids for some entertainment one afternoon. Heading back uphill to the main firetrail, I next walked out to near the Southern Outlet. The Council have closed the track here for some reason. I think it would be somewhat unsafe trying to cross the highway anyway, so I turned back. Interestingly, there are a lot more tracks than are shown on the map (Taroona 1:25,000). I find this quite strange, as the map is a 2005 edition. Not sure why they leave some of these tracks off, and I'm talking about the main, named and signposted firetrails here. From there I walked approximately northwards to an intersection of quite a number of tracks. A track heads quite steeply uphill onto Tolmans Hill, past a reservoir, and then downhill to Woodridge Place in the suburb of Tolmans Hill. You could probably park here as a starting point for a walk. Retracing my tracks, I then used an unmarked but obviously long standing firetrail to return to the car at the reservoir entrance. From here, another track heads uphill across the road. There are more tracks here which are not marked on the map. I climbed to the top of this hill, where the sun came out! I spent quite a while here trying to get photos in the brief periods where the sun came out from behind the clouds. There is also supposed to be a cave up here, Sixpence Cave. It's marked on the map, as "posn approx". I couldn't find it anyway. I'll have to go back and try again sometime. This track continues on, crossing Chimney Pot Hill Road, and joining a track up Chimney Pot Hill. 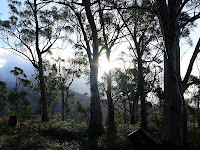 From there you can walk on to Halls Saddle. Anyway, the forest is fairly open across most of this area, and the walking is quite pleasant, even on a day as wild as today. I had rain, sleet, snow, hail, wind and occasional sun. 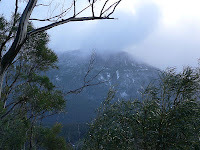 On a day when the weather is better, it would be good to climb Mt Wellington starting at Tolmans Hill. Charles Darwin apparently used these hills to access the mountain when he climbed it in 1836. I believe the Hobart Walking Club sometimes retrace his approximate route in a "Darwin" walk. It sounds bleak out there, but the photo of the dam comes up well, once one enlarges it. It must have been difficult to shoot. To be honest Denis, it wasn't as bleak as it would have been higher up on Mt Wellington, but it was a day better spent next to a fire, sipping something tasty. The only trick with the dam picture was getting the exposure right, the access is quite easy.